“Kundalini Yoga has been so transformational and heart-opening for me. It has given me a lot of peace, a sense of myself and a confidence within myself. My wish is to share these benefits with all.” Sopurkh began studying Kundalini Yoga & Meditation in 2000 with his Teacher Yogi Bhajan. 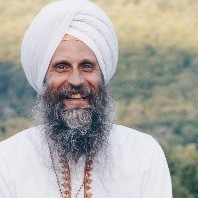 He now teaches retreats, workshops, and classes all over the world with his wife Snatam Kaur, under the guidance of his Mentor Gurmukh.